You’re sorely mistaken if you think that rustic means shabby and shoddy, because this modern home that was designed by Carnet Casa breaks all the moulds by creating a work of art that is truly a feast for the eyes. 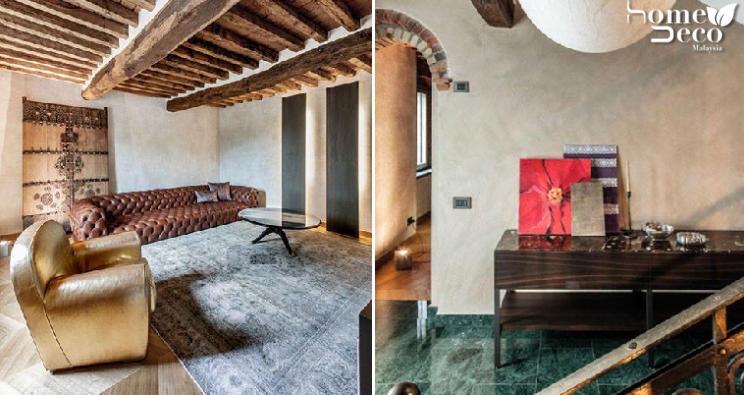 It’s rustic and luxurious at the same time, which looks really gorgeous and for those of you who are looking for inspiration, this home in Crema, Italy has plenty of style ideas that you can steal. It’s a spacious home that features heavy wooden features that look posh and plays around with lots of contrasting textures and materials. Thick wooden beams on the ceiling in the living room and all over the house is rather old-fashioned but it fits in with the room’s vibes and is complemented by the big, tufted leather sofa that looks so comfy and a golden armchair. There are not many ornaments in the room so that it won’t look too stuffy but the ornamental wooden door behind adds the finishing touch to the living room. The kitchen and dining room are combined into one big open space, with the same heavy wooden beams on the ceiling. There’s a metallic dining table paired with leather chairs while the rest of the kitchen has a more industrial and modern feel due to its contemporary furnishings. Both the floors in the living room and kitchen area are made of wood and this theme continues to the bedroom but the foyer sports an eye-catching island of green marble that simply screams elegance. In the roomy bedroom, the majestic bed takes centre stage with its huge soft bed frame and an adjoining metal bathtub that looks rather relaxing. For those who are too lazy to go to the bathroom and wash their hands, there is a freestanding barrel-shaped sink in the bedroom as well. If you noticed, the walls in the house are rather bare and adorned with concrete grey for a rather rustic look except for the two bathrooms which sport a cheetah-patterned wall and a lace-patterned wall behind the sinks that are just too whimsical for words. A mixture of stone and gold accents dotted around the house adds a touch of luxury to the home and ensures that it still looks classy and stylish despite having a more rustic feel. All images taken from Carnet Casa’s Facebook page unless otherwise stated.